First let's start with what hasn't changed. Non-profits receive 80% of their donations from individuals who are familiar with the organization's mission and believe in it. So what are the changes, and how do they affect Midwest Young Artists? This year for the first time since 2005, we didn't receive funding from the National Endowment for the Arts. While we submitted a strong application, the NEA made the competition stiffer by readjusting their guidelines to fund a wider variety of youth arts organizations, comparing us to all youth arts organizations, not just music, and then just by granting less money overall. We have applied for funding for next year, 2013-2014, but not getting funding this year puts us in the hole because we will not have the $58,000 we received last year. As our online personas grow ever more important via Facebook and other accounts, corporations and foundations increasingly tie their giving into social media campaigns that increase their visibility and allow for convenient interaction with their Facebook followers. MYA has been nominated to participate in the Chase Community Giving Program, but is unlikely to garner more votes than organizations possessing a national scope and network of constituents across the country. For example, the Balanced Mind Foundation in Evanston recently won a Pepsi Charitable Project. This organization provides on-line resources and chat rooms for families who are raising children with mood disorders. They serve over 600,000 visitors who use their online resources every year. Let us know what you think about these campaigns. If you have no qualms about connecting and voting on Facebook or if you have a bank account at Chase, please VOTE FOR MYA at the links below by September 18! We'd like to have more of a local reach than other Chicago organizations. Click here for link to Facebook vote page. 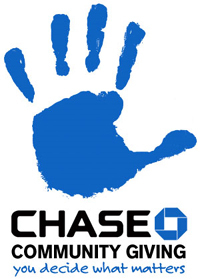 Click here for link to Chase Community Giving page.